This time 2-3 will be selected. Same as last time. Copy and Paste the application and just fill in. I'm assuming everyone else that applied last time is still interested. Feel free to make another post if you want to change your application post. Questions are a bit diff. Same as last time, only accepting people will all their toons in guild. -How long do you usually play a day? -How long have you been in Crisis_Core? -Have you ever recruited anyone? 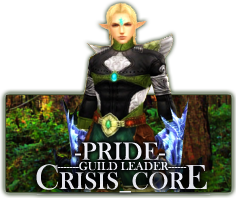 -A former guild member has just left and is bashing the guild whenever Crisis_Core is mentioned. What do you do? -A guild member is harassing another member. What do you do? -A guild member was KSed/Scammed by someone. What do you do? -You are attacked for being in Crisis_Core. How do you react? To anyone that doesn't make it, no hard feelings. Officers are just to keep me in check. We're all equal. Keep your eyes on open for other spots such as Event Manager, etc. Can i apply? Despite quitting? Lol. Location : Nom nom nom. Otherwise known as Port..because we hate typing those extra two characters. I'm the guy who always happens to be blocked from every guild picture ever taken..don't believe me? go look..it's a conspiracy. originally Mexico City, but now Texas, USA. I like the people, especially those who are always willing to lend a hand on something whether it be to kill a boss for them, help lvl, gold, etc. I like the fact the guild actually has a sense of direction and goals established and actually follow them as opposed to a guild of people who are just there and nothing ever happens. I also like when guildy parties are formed for lapis hunting at dinos or wherever and kill bosses! Those are always fun. Weekends are usually my good days. Tuesdays and Thursdays as well but it depends on my project loads. Graduating from university on December so hope to have more time after that! recruited? well ask Likearock! . Other than that no. I mean I've spoken of our guild to others but not sure. I believe the best thing to do under this situation is to simply ignore the person. This former member will eventually get tired, and above anything else, I believe the guild is strong enough to tolerate petty bashing from one member which considering the length of time this member was in, it is really important. I think by simply stating "sorry you didn't like the way things are run, hope you find a more suitable guild, good luck" is a good way to finish that up. If the member continues bashing then whatever let that person say whatever he/she wants...people will still join. Hey, bad publicity is better than no publicity eh? First I'd assess the situation whether the harassing is just playing or serious. First occasion i'd let it pass. Second time, I'd intervene and talk about something else to them. Third time give warning for misbehavior. Depending on later occurrences just kick them out. If the second offense was very serious then kick them out then without warning. I don't really understand this question. Is the guild member ksed by someone else in the guild or someone else in general outside the guild? Because if former, then I'd definetely notify the individual who ksed and let him/her know to be careful. Second time if accidental then warning else then kick out. In general those are the rules that Shaiya goes by anyway. First warning second time suspension. I'd abide by this. I personally don't think people will attack people in Crisis Core because people really don't care. If someone is in Eternity would one seriously take the time and attack them because they are/were in that guild? probably one has better things to do..I hope..at least that's my perspective on this. If not then that person is just pathetic. Second, seriously, no one would care, and not many people stick to that issue deep enough to make a fuss out of it. There are new people coming everyday and the veteran people leave so the flow of information..the reputation ..just withers away. But if I was attacked then..well I'd just ignore it. I mean so what. I'm here for my guildies and to play everything else is just irrelevant. Lol Pride. I just understood the reason for the questions. XP Well, I might as well answer them since it seems like an issue that's relevant. -Well, I'd do what I'm supposed to do and give a reasonable rebuttable. The thing is that ignoring, while yes does give you a sense of superiority over the nutjob, but it also reveals that you yourself are subject to the same logical fallacies. Simply because of the character of the person, you discredit the argument which is completely incorrect. The validity of an argument is in no way dependent on the person who speaks it. Also, you must also realize that the audience of such nonsense is people. If you keep your mouth shut, to others it seems as if what the person is saying is true because you bring no rebuttal as if you HAVE no rebuttal. Given that, however, you also don't want to stoop down to their level. So I say do your part by giving the best reasonable argument against the person and let people judge for themselves. You don't want to be in a state like ET or other large guilds where quite frankly, many of the guild members are pretty cool but there's an overall negative connotation that goes along with the guild. -First, you try to resolve why one guildie is harrassing another. Now, if the person can not be reasoned with or has simply had a bad day, unfortunately, the only option we as other guild members have is to try to do our best to support the one who's being harrassed. We have to make the victim feel like he/she is not alone and singled out. Now if harrassment starts turning into public humiliation or (god forbid) hacking and/or data sniffing, that's a matter to bring up with GM's, Aeria, and (hopefully not) criminal law. I've never been one for overstepping action. I can understand if you'e angry but I will not sympathize with foolish acts of disruption. - If I'm personally attacked for being in C_C, I usually like to ask why they think I shouldn't be here. I mean, quite frankly, it's not like what they say is going to change the condition of me being in this guild. I just usually like to hear people out. Sometimes, you have to admit, the reasons are pretty laughable. XP Otherwise, I must concur with the person above me. After hearing them out, just tell them that I'm sorry they feel that way, but I feel my place is here. -Have you ever recruited anyone? Yes i have recruited Kingpendragon until he had problems with his computer.